At long last, Adam has restored the lifts back to the initial zone of the station. Now that Samus is pretty heavily kitted out with skills and equipment, this means you’ll finally be able to poke around in all those areas of the administration zone that previously were unavailable to base-level Samus, right? A promising start: Right away you can veer left from the top floor of the elevator to see what was behind the wall the SA-X smashed when she made her cinematic debut. It turns out it’s just a single room with a missile expansion in it. This leaves the question of how exactly SA-X made it into that room to begin with, but I suppose you’re not meant to think about it. Still, I kind of feel like Super Metroid would have added some meager detail for the sharp-eyed. But that’s just me comparing this game to hypotheticals about its predecessor, which is terribly unfair. Still, my cynicism isn’t entirely unwarranted — once you reach the central zone of the station, you quickly find that most of the possible side paths here have been freshly blocked by those membranous growths. Now they’re yellow, and nothing in your arsenal can break through them. So even though you ostensibly have your freedom to explore restored here, in truth you’re still being railroaded in a decidedly unsubtle fashion. More and more complex navigational tests continue to appear. In this case, you have to reach the upper chambers of the station’s control center by freezing these wall dudes when they’re partially or fully extended, transforming them into makeshift platforms. You can enter from the lower levels, but all you’ll find are one-way passages (or rather, gates with gun sensors on the far side, which remain effectively one-sided until you acquire some substitute for the Wave Beam power). Once you reach your destination, you learn you’ve been sent in search of your old pals the Etecoons and the Dachora, who were hidden away in Super Metroid to provide a tutorial demonstration for Samus’ hidden innate powers of wall-jumping and shinesparking. They’re just kind of hanging out behind a glass wall here, evidently in captivity by the Federation or Biologic. There’s really no better metaphor for the difference between Super Metroid and Metroid Fusion than these guys. In the previous game, you might stumble onto them by accident in the course of exploration, and their actions would cause you to realize: “Oh! I can do that!” Here, they don’t really do anything, but the game forces you to go find them. Then Adam muses pointlessly about their presence, saying a lot of words about them without actually saying anything. Ah well. You set them free and they traipse along to Samus’ ship. I suppose if you really want to look for subtle meaning here, you could ask yourself how these creatures came to be on the station. Were they captured for study? Was Biologic preserving them now that their planet had been detonated and they presumably were the last members of their respective races? And why do they appear to be immune to infection by the X? I suspect that would be putting more thought into their role here than the game’s creators gave it, though, so maybe it’s for the best that you don’t waste too much time on such questions. With that fairly pointless detour out of the way, Adam tells you your next objective. More familiar creatures make their Fusion debut — or rather, their enhanced X mimic counterparts do. The X version of Geruta (formerly seen in planet Zebes’ warmer zones) have become far more difficult to destroy than in earlier games. Their outer claws now have a metallic trait, resisting all of Samus’ projectiles and forcing you to destroy them from below as they swoop down toward you. They tend to appear in narrow spaces such as this room. So while Fusion may have changed the flow and freedom of the series arguably for the worse, it continues to create new and challenging iterations on known hazards. As seems to be happening more and more frequently in Fusion, acquiring a new key weapon rarely affords you the opportunity to backtrack and use it on relevant obstacles you’ve just encountered. Instead, you’re railroaded off the known map and forced to find your way back to the main bulk of the station without guidance. This is not as liberating as the design of Super Metroid — Fusion is nowhere near as good at hiding its linearity — but nevertheless these journeys into the uncharted green portions of the minimap tend to be Fusion‘s most exciting sequences. Especially when you’re forced to detonate a Super Bomb in order to advance and unavoidably reveal yourself to the SA-X in the process. But, OK, whatever. Maybe the SA-X has, like, spidey-sense or something and knows you’re nearby but can’t pinpoint you precisely and is happy to hang around forever until you give yourself away. Sure. In any case, once you’re exposed, the SA-X opens fire on you. However, it doesn’t really give much chase; the passage forward is a narrow aperture that you have to roll into, and the SA-X doesn’t seem to like ducking into Morph Ball form except to blast the world with Power Bombs. Maybe the logic is that the Morph Ball is too vulnerable a form to adopt during combat — certainly you can’t help but take a hit or two while rolling through the passage to escape. SA-X has the Wave Beam power Samus doesn’t, so it can fry you through the walls. You need to be assume you’ll have to soak up two or three hits here, each of which blasts you for hundreds of health points, so both topped-off energy tanks and speed are of the essence in this scene. Having survived your first (mercifully finite) encounter with the SA-X, you can work your way back up to the main portions of the station. Passages previously obstructed by the yellow X membranes (Gelon) no longer pose an obstacle, as the Power Bomb can clear them away. As Samus grows more powerful, the game throws occasional optional tests of skill your way. This sequence is one of Fusion‘s most devious, a series of narrow passageways that tests your reflexes, your understanding of the Ice Beam, and your mastery of the Spring Ball. Your reward is a trifling missile expansion, because work is its own reward, apparently. At this point, the game inelegantly sends you back to the beginning in order to advance the plot. It’s the start of a satisfying, interesting sequence, but it’s presented quite poorly. Mid way up the elevator back to the administration zone, the power goes out and Samus becomes stuck halfway up the shaft as the elevator platform wheezes to a halt. Luckily for you, it happens to do its wheezing right next to a fragile portion of wall that leads to a service passage or something. 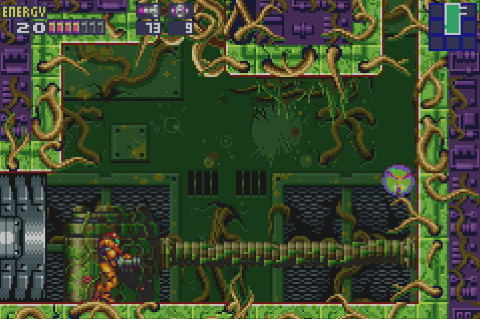 Never has the Alien influence on Metroid been clearer than as you roll through a passage where faceless quadrupedal creatures shuffle around in the overheat ductwork, dripping acid through the grates at you. Thankfully you can ignore your motion tracker and detonate Power Bombs here to make fairly short work of them. For now, however, you’re railroaded into another side mission. In this case, you need to restore power to the station’s reactor so you can move around freely again. Or at least as freely as Fusion allows you to move at any given point. The trouble at hand: Turns out Chekhov’s pupae have hatched. All the throbbing insectile grubs that have blocked key pathways since you defeated that boss in Sector 2 have molted, leaving behind hollow shells that you can now pass through. The former grubs have reached adult form and now are Kihunters, or X versions thereof: Sometimes-flying, always-goop-belching insects that take a huge amount of punishment and do a remarkable amount of damage. It’s interesting how much more dangerous common foes are here than they were in Super Metroid. The moltings coincide with the arrival of a tangled overgrowth of vines that have shut down the generator. Apparently the space station runs on turbines. Along with the Kihunters, you’ll also find Zebesian Space Pirates (or, yes, their X clones). They’re even more devastating than Kihunters in terms of power, though fortunately vulnerable to charge shots. The power station area essentially consists of a zig-zagging descent down a huge gantry of platforms populated by these guys, forcing you to dodge their triple blasts of energy beams in close quarters and beneath low ceilings. These crazy-tough enemies serve as your hors d’oeuvre for the boss of the reactor area, a massive biomechanical spider inexplicably known as Yakuza. It sidles up to you and demands protection money — no, wait. Actually, it simply sets about destroying you in very little time. Yakuza (less weirdly named Gedoh in Japanese) is perhaps the hardest boss in Fusion until you figure out the secret to beating it, which basically involves unlearning your standard boss-fighting tactics. The spider sidles around the room by moving along the background wall at a roughly 45-degree angle, reflecting at a 90-degree course change whenever it hits a wall, floor, or the upper edge of the battle area. It covers the full span of the screen with its movements, forcing players to react and avoid collisions. What makes this boss so difficult is that it can capture you with its forward appendages if you come anywhere close to them. Your instinct in a fight like this is (almost certainly) to stay low to the ground and let the spider pass overhead, but this makes you extremely susceptible to capture. When it grasps you, Yakuza behaves similarly to Draygon from Super Metroid: It pulls you into the air, slowly draining your health before slamming you against the floor for insane damage. Even though Yakuza’s general tactics should seem familiar, it’s a vastly more dangerous battle this time around. Draygon could only capture you when it drifted slowly into the arena, whereas Yakuza can snag you anytime, and it always moves quickly. Unlike Draygon, it only needs to get hold of you a few times to bring the fight to an end; the first time you face this enemy, it could be over in a matter of seconds. As with Draygon, the safest tactic is to take enormous leaps over top of the monster in order to avoid its grip — more easily said than done. Occasionally it will pause to belch fire, which is when it’s vulnerable… only in its maw, unfortunately, and only for a brief moment. You have to be mindful of where Yakuza pauses to drop its flames, since it’s easy to get so carried away pumping it full of missiles that you fail to notice it’s close to a wall… which means that when it begins moving again, it’s reflect directly into you. The saving grace of this encounter is that your missiles are legitimately powerful now, so you don’t have to hit Yakuza too many times. On the other hand, the creature has a second phase, as if it weren’t difficult enough already. The second phase is much less dangerous than the first, since it loses its deadly legs here, but chances are good that the initial boss form has whittled down your health. It’s a grueling, challenging, fast-paced battle — the biggest variance from the traditional slow-paced Metroid style Fusion has presented to date. And yeah, there’s an X-core on top of that. But hey, now you have infinite jump. Defeating Yakuza restores partial power — evidently the creature was feeding on the generator? — so you can save. But you still need to clear out the vines, and there’s only one route through which to do this. Again, you start to find secret connections between the various divisions of the space station as you explore off the beaten path. Unsurprisingly, perhaps, the source of the vines appears to be something growing in the tropical sector 2. More surprisingly, on the other hand, is the way the one-way block in the ceiling drops you directly into the SA-X’s line-of-sight. …much of a fighting chance at all, really. This entry was posted in Anatomy of a Game and tagged 2002, anatomy of a game, game boy advance, metroid fusion, nintendo. Bookmark the permalink. Dropping in to SA-X is one of the most daunting and thrilling moments in video gaming for me. What could make you feel more hopeless than running for your life from a much stronger version of yourself? This was one of the more spooky parts of this game. Say what you will about about Fusion’s linearity, but this sequence—starting with getting the Power Bombs and ending with the escape sequence in Sector 2—delivers on the honest-to-goodness fear that the designers were going for. It didn’t take me long to find Spiderthing, but it took several tries to kill it, which stank because there were no save rooms except for the ship. That sequence in TRO with the SA-X haunted me. Even now when I pick this game up and play through it, I **still** get nervous when that part comes, even though I know it so well that I usually don’t even take a single hit. This game does ‘fear’ SO well. And for that matter, how did Dakora and the Etecoons escape Zebes in the first place? When you free them in SM, they run off the screen to the right, and during the ending sequence you can see a tiny little purple dot flying out of the planet, which doesn’t appear if you didn’t save them. IIRC Nintendo’s SM player’s guide refers to this as their ship. So they can fly a ship? They HAVE a ship? How did IT get to Zebes? Like you said, not things the developers probably thought about, but still fun to ruminate on. The Yakuza/Gedoh battle was where my journey ended the first time I played MF. This was mainly because on the original GBA screen I already couldn’t see jack, and this boss was a dark gray against a shadowy background. When I came back later with backlit screens, I was finally able to progress. I think the power-bomb-vulnerable growths appearing in the main area is the most egregious form of player restriction in Fusion. Even more so, because they don’t restrict you from anything important anyway. Pointless frustration. I love the design of ARC, the way you keep revisiting it and seeing more of it each time, and each time, you have to find your way back in a different way. And of course, the suspense of Nightmare passing by in the background, and then half the area being wrecked when you come back the last time is fantastic. Usually, when I get to the elevator stoppage, I have to stop playing. Because I know that once I go past that point, I’ll likely keep playing until the end of the game. The game really kicks into gear as the shackles start to fall off. 3-dimensional space. We’re not seeing what’s in the foreground or the background, either of which could entail sprawling real-estate. This is also how we can explain “invisible” walls in 2D games: The opening as viewed by the in-game character is probably a clearly visible rectangular crevice carved into the center of the wall, but our perspective is only of the wall’s foreground surface. So we see them as “walking through walls” when they’re more likely crawling through tunnels that we, the players, can’t see. This post covers some of the most remarkable parts of Fusion for me. The habitat zone segment, the forced linearity, “Come back to the ship for no reason”… worst part of the game. But then the power goes out, there’s the secret passage to TRO (wow, secret passages between the zones!) and the SA-X encounter, which might very well be the best part of the game. I don’t know what happened between turning the on-to-off, but it was all beneficial! *spoiler* considering there are multiple sa-x in the area, maybe that one was just hatching there? Do… do X parasites hatch? Is that how it works? Well, it has been shown that some of the X-parasites dont seem to need a host to infest, a few of them just float around and then mimic a given form (not sure how admittedly, maybe they somehow share to each other a given genetic set or whatever), and the biggest proof the sa-x herself (rather themselves!) – hell, when you defeat the last one it rolls back into an x-parasite, only to escape and mutate back into an SA-X. And given they can float through walls and such, it wouldnt be that farfetched to say that particular SA-X mutated (not “hatched”, whatever) there. Its likely the devs didnt actually give much thought to such events, as there is nothing that properly hints as such, but it is not that unfeasible that it happened tho. And the simpler possibility that it just came to mind, maybe samus suit was the for whatever reason? I can tell you had a really fun time with this one. I’ve been playing along with these updates, and enjoying the heck out of it. This section is great. Running from SA-X is adrennaline inducing in the best way. For the first time, Samus feels hunted, rather than being the hunter.